A few weeks ago, I shared a lesson from my friend, Sandy called, N.O.W. (News of the Week). Click HERE to read more about that lesson. One of the problems with this lesson is it can be overwhelming for students who either aren’t on grade level or students who have trouble with focusing. So, the lesson was modified. Cut a file folder into strips. The shorter the attention span, the smaller you will cut the strips. I cut this one into 3 parts. Students open 1 flap at a time and always begin at the top and work their way down. Students complete the work that they can see when a flap is open. Close the flap and then open the next flap until they finish the assignment. This makes the assignment in “bite size pieces”. 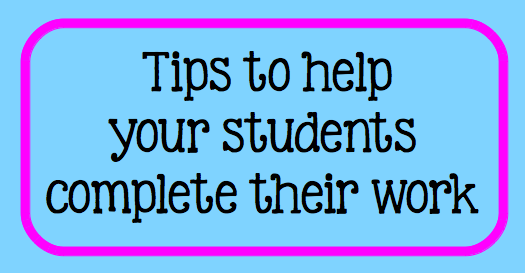 Use this strategy with students who have trouble getting started on an assignment. With those students they are overwhelmed with all of the words and graphics on the page. They don’t feel like they will ever finish the assignment so why even begin. If they need extra motivation and a chance to move, you can set up a stamp station near your desk. Each time they complete the work in a flap area, they show you the work, and then go to the stamp station to get a stamp. Some students need as many of their five senses as possible incorporated into lessons. One way to do this is assigning the student a few problems at time. Circle the even number problem. When the students finishes with those problem, he/she will show them to you. Then you will circle the odd number problems. The student is getting up moving more which helps. You can add seasonal fun and a sensory touch to this if you use scented markers to circle the problems. In February, circle the numbers with red and pink. In December, use red and green to add a Christmas touch. Great article. Awesome idea about the flaps! I am wondering what font you used on the modified worksheet "NOW2"? These are great ideas especially about getting the five senses involved. So smart! I love the cut up folder idea! Pacific Myst: It is called payphone. I just saw the flap folder on pinterest. Great idea! I teach high school ESL. Many of them are never diagnosed with any learning problems. So, these ideas are great for them, also. I am considering home school next year for my granddaughter, who is severely ADHD. This 3-flap folder is a great idea for her. I will incorporate this into her daily schedule. Thank you!!!!!! I love this idea! I find that 'chunking' assignments really helps with my homework coach students! I really like the 'flapbook' idea! I find that 'chunking' assignments really helps with my homework coach students!